The two most common causes of knocking noises and instability in this washer during high speed are: 1) a bad shock absorber and 2) a bad “drum support spider“. On these washers, if a shock absorber is bad, it’s usually obvious — you just need to get some eyeballs on ’em. Just remove the rear panel from the washer and there you be, as shown here. Click the pic for a larger, annotated view. If one of the shock absorbers is bad, replace ’em as a set. Easy fix! The drum spider, OTOH, ain’t quite so obvious ‘cuz it’s attached to the drum and is hidden from view by the outer tub. So we have to use special Zen Techniques to diagnose it. 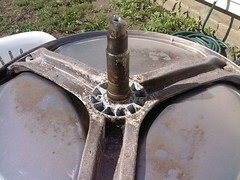 The main cause for failure of the drum spider seems to be galvanic corrosion. You can see the corrosion at an early stage on this spider. Click the pic for the larger view. The drum support spider in this Frigidaire washer had corroded so much that the hub and drive shaft actually broke off. 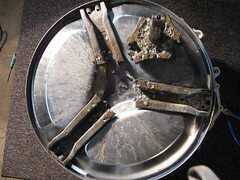 Note the pitting in the metal. That’s from galvanic corrosion. It weakened the spider structural strength so much that it failed during use. Whence cometh this galvanic corrosion? 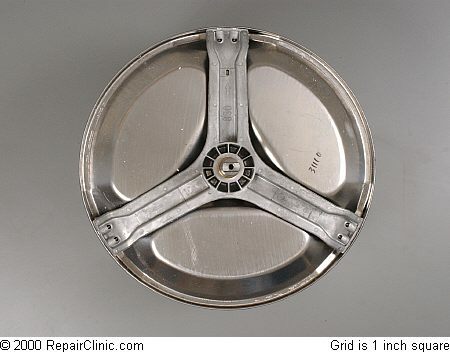 Not certain at this time but distinct possibilities include: 1) dissimilar metals between the spider assembly and the drum setting up a galvanic reaction– which would be a design flaw, 2) some combinations of detergents, fabric softeners, and water conditions may set up a galavanic "cell" inside the washer during use, 3) improper, poor, or no grounding at the outlet the washer is plugged into could result in small, stray voltages in the drum during wash inducing stray currents and causing galvanic corrosion (could I have said that with anymore geekspeak?). If you decide to take this beast on, here’s some complimentary teardown information that’ll hepya. And if you’re looking for some good reading material for the outhouse, you can buy the complete service manual for this washer. 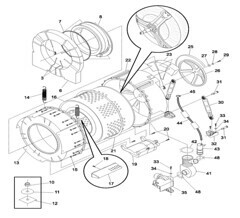 This entry was posted in Washer Repair on May 19, 2009 by Samurai Appliance Repair Man.